This blog post was written by Graham Stone, Jisc Collections Senior Research Manager, and Mafalda Marques, Jisc Collections Research Analyst. As a final output of the Institution as e-textbook publisher project, we have created a toolkit to provide practical help and support to universities wishing to start or that are already in their initial stages of e-textbook publication. It is aimed at all staff who have an interest in this fast-developing area, such as information professionals, university press staff, learning and teaching advisors, educational technologists, academic staff and senior university staff who may wish to consider publishing their own e-textbooks. What are the advantages for institutions to create their own e-textbooks? The UK spends a conservative estimated amount of £30-40 million on e-textbooks. However, little progress has been made in achieving acceptable savings from major publishers for UK higher education. Open e-textbooks published by the sector, for the sector present an opportunity to keep the money within the system and to build capacity and skills. It also levels the playing field for students, giving parity and no hidden costs. Open textbooks can be blended with teaching practice, by allowing the outputs to be moulded to individual methods, while protecting copyright and IPR. Furthermore, recognition and reward at a national level promotes teaching excellence. The toolkit will help institutions wanting to provide an alternative to expensive textbooks produced by commercial publishers by providing practical help and support to universities wishing to publish their own e-textbooks. What guidance will you find in the textbook? Why might an institution want to consider establishing an e-textbook publishing venture? This section sets the scene for the critical stage of research and planning and explores the potential benefits and the challenges of embarking on textbook publishing. It also provides some practical guidance on different ways this can be achieved either by individual institutions or collaboratively. What is the process a publication goes through from conception to publication? This section provides an outline of what is involved in the publishing process, including content acquisition, writing and production stages, and highlights the need to establish clear submission, review, and production procedures early on in the venture. Authors need support during the process of creating e-textbooks. For example, training or time away from academic duties to write. The key to providing adequate support for staff is to ensure that your textbook initiative is well planned, that the resources, skills and time required for the job are well understood and provided for, and that there is wide buy-in for the idea at the institution. Technologies play an important role in the e-textbook production cycle: authoring the content, developing the content into an e-textbook format, publishing and promotion. This section presents ways of identifying your audience. It outlines potential distribution channels for both open access and print sales, and ways of bringing e-textbooks to the attention of both students and academics via a range of marketing and publicity activities. This section offers guidance on the methodologies used to evaluate the performance of e-textbooks. It looks at why evaluation is important, what should be evaluated, methodologies and tools, and addresses the challenges of evaluation. Publishing students work in the form of e-textbooks builds institutional reputation as student publishing is opened out. This section looks at the reasons and benefits for publishing students work and considers what work to select for publication, ethical issues, support needed, revision and contractual issues. How can we further support your institution? We would like to hear your thoughts on the toolkit. Was it useful to you? Is there any content that you think we have missed? Do you have any examples or best practice to offer? Jisc Collections is in the process of refining a new e-textbook strategy, a core element of which will be to help institutions make the business case and implementation case for e-textbook publishing or moving towards open access. This blog post was written by UCL Press. UCL Press conducted student and staff surveys on the two Jisc e-textbooks, Textbook of Plastic and Reconstructive Surgery and Key Concepts in Public Archaeology. As well as questions on the textbooks specifically they were also more general questions in the surveys about resources for modules/courses and ease of access to these. Surveys were sent to students and staff on the MSc Burns, Plastics & Reconstructive Surgery and MA Public Archaeology courses. Respondents were overwhelmingly content that their institution had access to all the resources they needed. One respondent noted that ‘although the textbook is available for borrowing from the library as well as online, the copies are limited so we have purchased our hard copy’. In addition, 67% felt that a free e-textbook produced by the university influenced their decision to add it to a reading list. 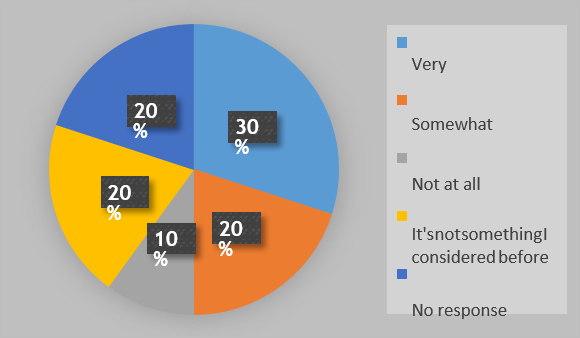 When asked whether this was the only e-textbook used for the module or course, there was a 57:43 percentage split with slightly more respondents using more than just this e-textbook. The preferred format for module and course materials for staff was 2:1 in favour of print material. In addition, when accessing the e-textbook online, the majority of respondents used Moodle or another VLE. One utilised the iBook store, while another downloaded from the website and saved as a PDF. When asked about the format used to access the e-Version, the majority used the EPDF with only one user utilising an app. No students had purchased the textbook, but they had borrowed it from the library. This was the only e-textbook that they used for their module/course. One student noted that the UCL e-textbook was the most useful ‘as exams were based on these chapters’. E-book was the preferred format, in EPDF, accessed on a laptop. ‘67% [of academics] felt that a free e-textbook produced by the university influenced their decision to add it to a reading list’: This suggests support for both open access and institutional publishing. The comment about limited availability of the textbook from the library suggests there is not adequate provision and points in favour of having an open access electronic version that can be made widely available. It’s interesting to note print is still a favourable format for staff. The app has not been utilised as much as other e-formats. Also interesting to note the student preference for the ebook in EPDF form which suggests they are content with a simpler format. The price students state they would pay for reading material also suggests a need for lower-cost alternatives to existing commercial books in this subject area on the market. In terms of willingness to spend money on reading material, students felt £15 per book, or £100 in total would be the maximum they would spend. Students accessed the e-textbook via the UCL Library, UCL Press website or Moodle, accessing in on laptops in EPDF or HTML. The majority of respondents found the e-textbook helpful and were very satisfied with the volume, and found it better than other reading material on their module/course. Students found it complementary to other reading material, noting that ‘this book offers a solid foundation in the various themes discussed within the course’ and that it was a ‘perfect start point and very approachable’. Again the EPDF format appears to be popular. Posted by Mafalda Marques on August 2, 2018 in Uncategorized. This blog post was written by Errol Rivera. This is one of the questions we were most excited about. It was also a question that turned out to be more challenging to answer than any of us anticipated. The sheer number of platforms on which a book can be made available, the different means of accessing, the limitations of the data kept by those places and the protection of that data all combine to determine how much you can answer a question like this. The two titles available from UHI’s e-textbook production team, are required reading in six different modules across their university, with some overlap between them. They are also listed as recommended reading on additional modules at both UHI and Edinburgh Napier University, though those numbers have not been finalised at the time of writing this. The majority of these modules where these titles are required reading are comparably smaller in size, averaging fewer than 20 students each and some as small as five. This is likely due to their nature as research books, which are used at higher levels of study and in honours courses, of which nearly all these modules are. These titles are used not simply across modules, they are used across disciplines both in the sciences and the arts. From an evaluation standpoint, there are two major implications from this scenario. The first is that the distribution of a high level book of general skills such as these can be (and are) on par with that of a specialised etextbook for a single first or second year module. This means that their embedding in the University of The Highlands and Islands is anything but negligible. The second implication here is that as high level general skills etexts, their potential usage may only be limited by limited by nothing less than the entire number of research and dissertation modules offered by the university. Both titles are available in the University’s library system in both electronic and hard copies, but tracking their usage has proved challenging. However, this is not necessarily a bad challenge, nor is it insurmountable for IAP evaluators. Much as the embedding of these titles are diffused across different modules, the availability of these titles are diffused across different platforms and sources. This is because the UHI production team has prioritised ease of access in the titles it produced and for the comparably low price of £1.99. This meant that the UHI production team strived to distribute their books by as many means as possible. Therefore, while UHI’s e-textbooks are available in the library, the library was not the only way they made it to the classroom. How Do Students Perceive UHI’s etextbooks? While the majority of the embedding enjoyed by these titles has occurred at the University of the Highlands and Islands, they have also been piloted at Edinburgh Napier University. Obtaining feedback from students can be challenging for a number of reasons including privacy, time, and interest. Our research shows that once a student has established the relevance of their texts to their studies, then they are satisfied, and that relevance is determined almost solely by the lecturer. Of course, there is more to it than that. Accessibility, formatting, and quality are just some of the concepts that have an impact on how we perceive books. But they’re not always the ones students are conscious of. For an IAP evaluator, it’s easy to be overwhelmed by the number of aspects to an etextbook that influence how a student experiences them. The challenge is focusing on those aspects that students have likely formed opinions about. So, designing surveys and methods for gathering data on perception became increasingly a matter of streamlining and personalising as time went on. Our questions became leaner, more intuitive to answer, and more qualitative as time went on. What we’ve learned is that the titles produced by UHI are what we call ‘complementary’. In the context of our evaluation, complementary is one of several different levels at which a new tool becomes a part of an established workflow and does or does not change that flow in the process. What these students were telling us is that the titles in question served best as references, truncating information found in more in-depth texts and class lessons, or combining information from multiple texts and class lessons, but not to a degree which might replace what came before it. This might also explain why the qualitative feedback that’s been recorded indicates that these titles are seen by students as “refresher” material, not only complimenting their other learning resources, but potentially useful beyond academia and well into their professional practice. This blog post was written by Laurence Patterson. The eTIPS project, sponsored by Jisc, is a collaboration between The University of the Highlands and Islands (UHI), and Edinburgh Napier University (ENU). eTIPS saw two eTextbooks authored, formatted, and completed by academics and others. The two eTIPS eTexts published offer universal interest for undergraduates and postgraduates, discussing student preparedness for research and project work. Both texts were published, as Kindle eBooks, through the Kindle Direct Publishing (KDP) service, and made available, as a result, across the Amazon international network. This short blog post is not about Amazon itself, which is addressed in previous writing. Created in 2007, the KDP platform, in general terms, offers a relatively simple authoring process, a cost-free membership for publishers, and an effective audience each, potentially titles are made available to millions of readers. Because of this, KDP has become the world’s leading electronic distribution service, used by millions of self-publishing authors and smaller publishing houses alike. Publishing a Kindle title offers few complications. After creating an account, one would assign metadata to the item before uploading the cover-art image and formatted text, set a price, click PUBLISH and, within half a day the record appears on Amazon. Changes can be applied iteratively – an updated version visible for readers to download within another six hours. Royalties are paid, as standard, based on the number of times a Kindle title is paid for and downloaded by the reader over a thirty-day period. Generally, sales data is good, if rather limited. The KDP system allows publishers to see how many copies have been purchased, at which Amazon store and precisely when. For most people, this is probably sufficient. A publisher would not create any content on KDP, then – the cover art, and the edited content are produced ahead of time. Kindle Direct Publishing offers only the route, to allow the title to appear across the Amazon network. There are downsides. Formatting for Kindle and, specifically, for the .mobi filetype that is recognised by Kindle readers, requires text and images are formatted in precise ways, that metadata and cover art complies to guidance, and that content is appropriately presented and targeted. That .mobi filetype is, indeed, proprietary, and is likely to be unusable outside the Kindle/Amazon service. Additionally, publishers are required to register for tax indication before receipt of royalties, to complete a comprehensive registration process, and to address any content issues (for example, by uploading a revised file), where Amazon discovers them. The relative ease with which a title can be published through KDP has infused its popularity – tens of thousands of new eBooks are made available, each month, on Amazon – and the majority are distributed through Kindle Direct Publishing. This offers significant risk for a publisher – how discoverable is their eBook, how resilient, and how profitable to use KDP? For eTIPS’ books, sales and royalties remained low, but grew, over time. That issue of ‘profit’ may be a contentious one for a University wishing to write, and to distribute, effectively, academic content. If an institution’s primary motivator is the development and distribution of content in a way that aligns with the ‘open’ agenda, a commercial path such as Amazon is ill-advised. KDP to not permit publishers to make a title available for free, permanently. Amazon’s philosophy is not in this direction. The Smashwords platform could cater, however – titles don’t have the major distribution reach there, that they might do on Amazon, but at least publishers can upload simply, put a ‘free’ price on, and copy and paste a download link for everyone to access the item. For institutions wishing to establish a traditional University Press, for example, which intends to return a profit on distribution, the Amazon route is one to look at. In recent years, KDP has taken steps to move forward in the marketplace. Opening online stores in Japan, India, Australia and China, its spread is larger now than it was two year ago. It has developed a simple suite of promotional tools – countdown, unlimited – to help the publisher gain further reach for their Kindle titles but require that titles are not published anywhere other than through KDP, when those tools are used. Some suggest that this exclusivity clause is responsible for the relatively poor performance of competitor distributors, like Smashwords, or Nook, Apple iBook, or Barnes and Noble. A University that wishes to investigate in-house content creation must consider, at the outset, the distribution path for that content, that is most appropriate to their needs. Is there a desire to make a profit or not, and is the intended readership local or international? What resources do you have at your disposal – for example, are you able to create and format to the specifications of KDP, with a minimum of support? This blog post was written by Scott Connor, Educational Development Unit, University of the Highlands and Islands. In creating our first two etextbooks; ‘How to write a research dissertation’ and ‘Undertaking your research project’, we designed a workstream based on existing processes gained from our well-established digital content development unit. This worked well for us and in general we only had to make some minor adjustments to accommodate the publishing of etextbooks. In the first two publications the authors of the books were long-serving members of university staff with many years of writing and publishing experience. This was always the plan, and it worked well within the agreed workstream. 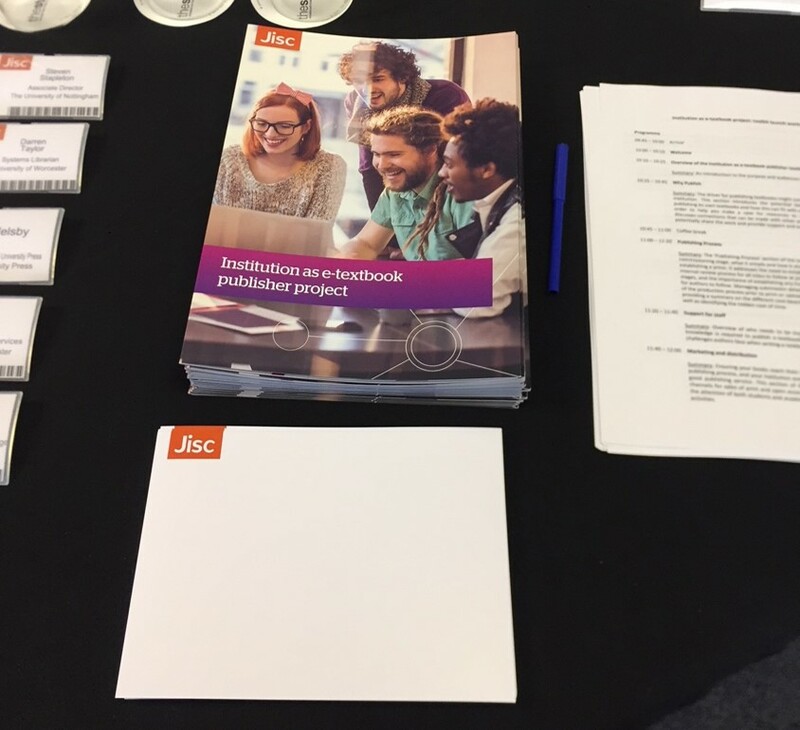 From the outset there was always a desire to extend the reach of etextbook publishing beyond the scope of the Jisc project and to embed it within the university. The list of potential benefits to university staff and students as creators, co-creators and consumers of etextbooks is long, not to mention the benefit to those external to the institution as collaborators and consumers. Our third publication could have come from a variety of sources however an opportunity arose to publish a dissertation by one of the university’s students. This was serendipitous, created by a demand following various of conference appearances. This article highlights some of the issues encountered as we moved from publishing staff work to publishing the dissertation of one student’s work within the University of the Highlands and Islands. It does not cover mechanisms for selection or the criteria for this decision and assumes that the content has already been identified. Institutional publishing of academic content differs from self-publishing in that there is generally a higher level of scrutiny and therefore perceived credibility due to the more rigorous review process and the desire to protect institutional reputation. Publication as an etextbook raises expectations of quality. In publishing the student dissertation we expected to adopt the same approach as we had with the previous two books. As we progressed a few issues appeared that we think are worth highlighting to other institutions who might wish to follow the same path in the hope that they can avoid them. Those that were a product of the decision to publish post writing, that is that the dissertation and associated research was undertaken prior to any thought about publishing. Those that would have been present irrespective of the decision to publish. The post writing issues were the most complex as they tended to centre around legal aspects of publishing such as ethics, ownership and copyright. As part of the dissertation process the student was required to obtain ethical approval for their research. This approval was quite specific and contained many factors relating to aspects of data collection such as who the subjects are, what data will be collected, how it will be stored and what it can be used for. The research participants were informed and consented. Issues began to arise when it was decided to publish as this constituted a change of use and one that consent had not been requested for. It is crucial that this is considered from the very outset, trying to gain ethical clearance post research and post publication is fraught with difficulty. The refusal of one or more subjects could result, at best, mean a rewrite of your conclusions and at worst mean your conclusions have no validity. As a student of UHI, copyright of the chosen dissertation belonged to the student and this is generally the case, however universities have different rules regarding ownership and copyright of student work. Exceptions can arise where a prior agreement has been signed or where the research may have been sponsored by an external company who may wish to have some ownership. Copyright of any images, graphs, etc. that may be contained within the publication present their own issues as copyright clearance will have been sought for the student’s work however it may not cover use for this new publication. A clear understanding from the outset should help negate any subsequent misunderstandings. Due to the nature of this dissertation images were sparse, therefore time and even finance should be factored in to allow for the sourcing of copyrighted images for publication. Like many dissertations this one was written in the required style, register and vocabulary of the discipline so providing guidance on the preferred writing style required for a publication may not actually be very helpful. This requires some reworking the student dissertation to make it suitable for your readership which will take time and academic rigour. A dissertation, as an academic publication, follows a format and will be of a certain quality (content, spelling, grammar, readability, etc.). These conditions can vary and even although, as in our case, the dissertation was of an extremely high standard, there was still a requirement to make changes in preparation for publication. These changes were influenced the intended audience and their expectations, and how we wanted the publication to reflect our institution. It would be advisable to decide whether you have one standard or a few standards of publishing and what the parameters are as this will affect the resource (financial and human) required to reach publication. In all the excitement of progressing the next publication it is easy to forget the potential income or royalties’. This money must go somewhere, belong to someone and be distributed somehow. Early discussions around this are worthwhile to avoid any misunderstandings or delays later. In the case of UHI the author wished to donate the money to a charity, however the institution (who was handling the money) was unable to fulfil this, as institutional policy prohibited donations to charity. One potential solution would be to make a nominal charge for the book with the proceeds being donated to a university fund to support ongoing student publishing. Another option would be to make the book free and open. However due to the chosen publishing mechanism (Kindle KDP) and their restrictive policy on distribution and cost this would require the undoing of many processes. Although the account above reflects the experience of publishing one student dissertation in one academic institution, it hopefully provides some direction to those wishing to travel down a similar path. This blog post was written by Emma Thompson, Education Lead, University of Liverpool Library. Using Primary Sources (UPS) was published 18 months ago, and we now have one full academic year of usage. Where did that time go? During the 2017/18 academic year Using Primary Sources has been established as key reading here in Liverpool on seven modules in History. These range from the first year module History Matters, though the second year module The Historian’s craft, to the final year dissertation module. Fully embedding this new resource in the curriculum, and ensuring that access is there for all students has enabled lecturers to develop lesson plans around it. This is a resource that really helps teaching and learning in Liverpool, but because it is open access there are benefits for the wider academic community as well. The eTextbook has allowed lecturers to use an interactive resource in a way that encourages students to think about research techniques, and the range of source materials that are available to them. Dr Jonathan Hogg, Senior Lecturer in History and editor of Using Primary Sources, has developed a Study and Research Guide for Using Primary Sources to aid Liverpool colleagues with the integration of the resource, this can also be used by other institutions with a creative commons licence. AS UPS is open access the benefits of this rich eTextbook are not just available to students in Liverpool. Statistics show 964 users of UPS of whom 263 have created accounts on the Biblioboard platform. Analysis of the usage has shown that the majority of people who visit UPS are in the United Kingdom, many of whom will be Liverpool students and staff who we can see are referred from our VLE, reading lists system and Library catalogue. We were not surprised that peak usage was during October 2017, around the time when students’ modules are underway and they will be working on their first assignments of the semester. There is interest outside the UK with visits from North America, mainland Europe, Australia and some have come to the eTextbook from Japan, Algeria, and Brazil. The only continent not yet reached is Antarctica (yet). As well as plotting how to integrate UPS into Antarctica, during 2018/19 we will be ensuring that UPS will be introduced to more Liverpool students in History. There is also interest in other parts of the University of Liverpool where the success of this resource has been noted and plans are being developed to create similar eTextbooks. During the project, participating institutions created eight textbooks covering a range of subjects, applying business, licensing and distribution models and reporting back on the impact, value and viability of the models they choose. Over the past 6-9 months, our project partners at Liverpool, Nottingham, UCL and UHI/Edinburgh Naper have been working hard to produce a first public draft of the Institution as e-textbook publisher toolkit. We are very pleased to officially launch it today to coincide with our final project workshop in Birmingham. What you will see if you follow the links below is the first draft of the toolkit, over the course of the next few months we will add more content from the projects and source external content as appropriate. The toolkit can be read as a whole, or the appropriate sections can be consulted as required. We have added links between the sections where appropriate, more internal navigation will follow. We have kept the wording in the sections to a minimum for ease of reading. However, each section also includes links out to more information produced by the teams as part of the project. This version of the toolkit is a draft version, which will be subject to open peer review by the community over the course of the next 6 months. This means that we are very interested in your feedback and comments. We will produce a final version, which will be available on the Jisc website in autumn 2018. 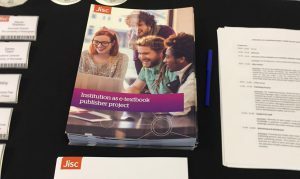 Jisc’s Institution as e-textbook publisher project, developed in direct response to the unsustainable models and high price of e-textbooks being made available to institutions, has been exploring alternative ways to create learning materials for students. As the next stage in this work, we’ve been exploring why authors choose to publish textbooks and other learning resources, and how institutions can support and encourage them to do so. We’re running focus groups in London and Manchester to share our findings and explore some of the issues with institutional staff. If you work in the library, publishing support, academic development, teaching and learning, learning technology or related areas, we would love to gain your perspective. This is a great opportunity to help shape the future of learning resources in UK HE. Jisc will cover all reasonable travel costs for you to attend. As the next stage in this work, we are running a research project to understand why authors choose to publish textbooks and other learning resources. We’re running focus groups in London and Manchester to understand author perspectives on these issues. This is a great opportunity to help shape the future of learning resources in UK HE.